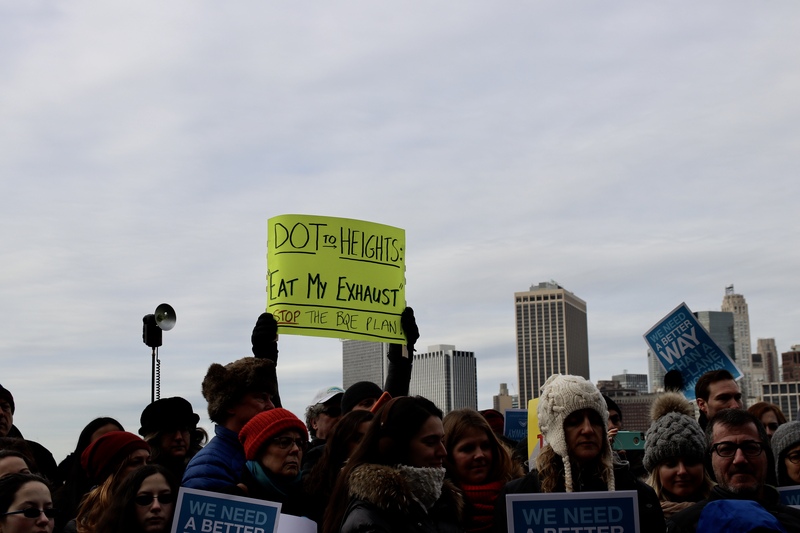 BROOKLYN HEIGHTS – Several hundreds of people gathered on the beautiful Brooklyn Heights Promenade in the freezing cold to rally against the Department of Transportation’s (DOT) plan to turn the historic Promenade into a six-lane highway while repairing the deteriorating Brooklyn-Queens Expressway (BQE). Last September, the DOT announced two rehabilitation options to repair the crumbling triple-cantilever section of the BQE. The first plan, labeled as the “innovative approach” would cost $3.2 – $3.6 billion. 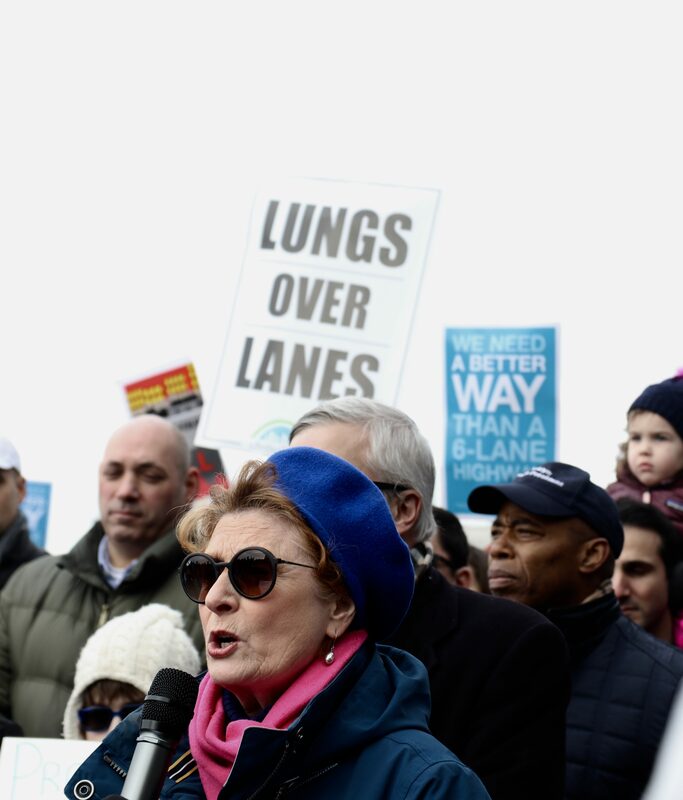 This proposal would create a temporarily elevated, six-lane highway at the level of the existing Promenade, which would close the pedestrian walkway for about three years. 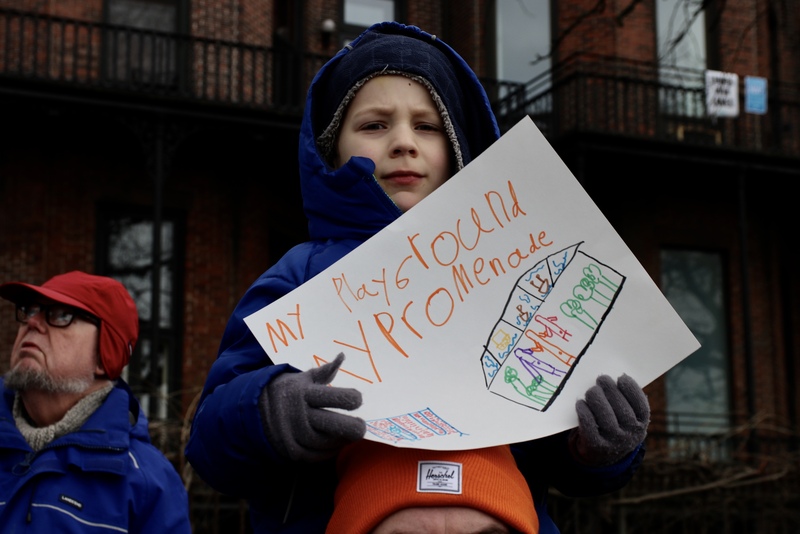 The children’s beloved Harry Chapin Playground would be demolished as well. 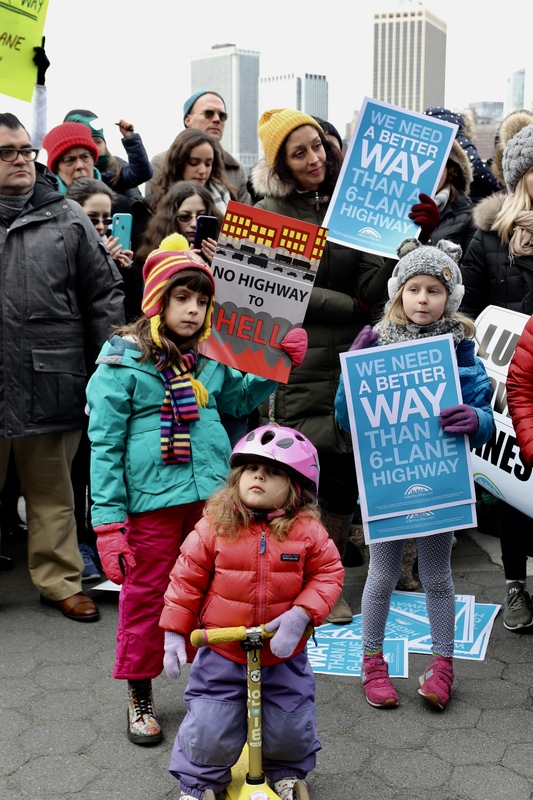 If this plan were to go through, some traffic (about 150,000 vehicles) would eventually be re-routed to the local Brooklyn Heights’ streets. The entire lifespan of this project is about six years. 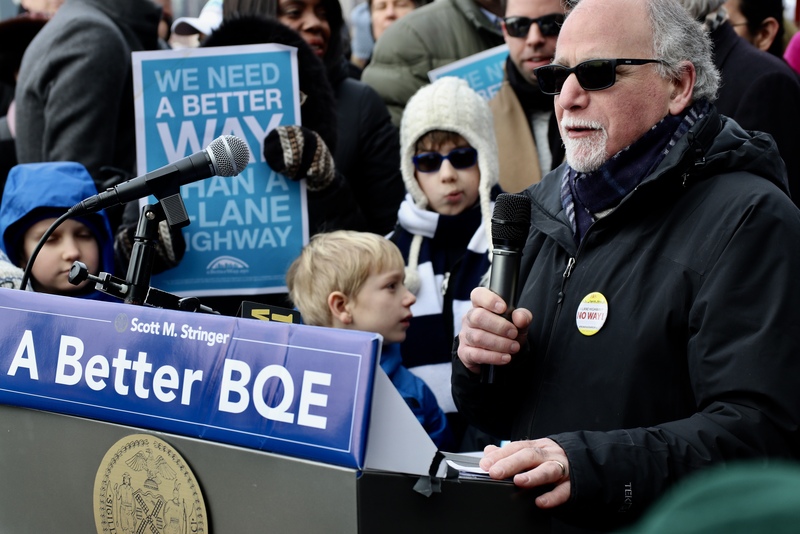 The second “traditional approach” proposal includes incremental lane-by-lane closure during nights and weekends, extending the project two additional years making for an 8-year overhaul of the BQE. This plan is more expensive, costing anywhere from $3.4 – $3.6 billion. What do people in the community want? They want to keep their promenade. The alternative plan Bray mentioned came after the BHA met with the DOT two months ago. 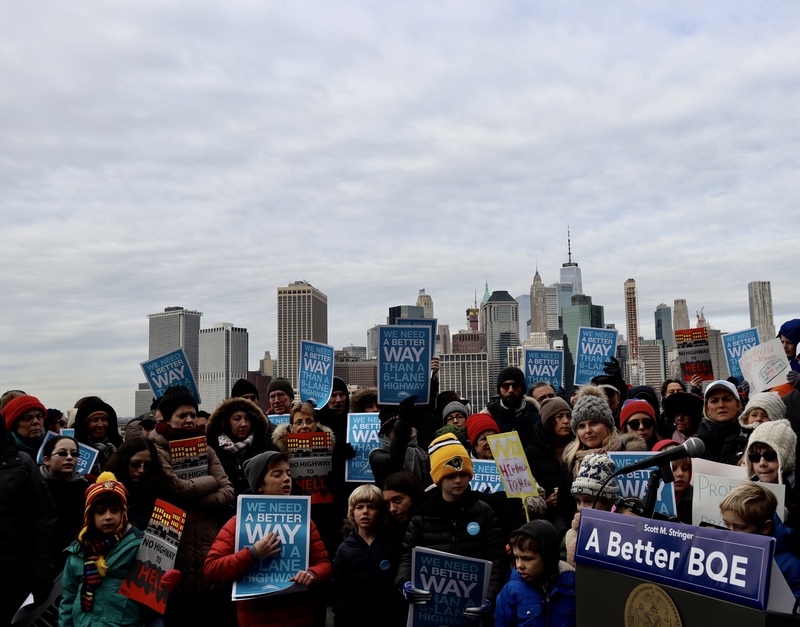 The plan would re-route BQE traffic west to a temporary two-level structure built on Brooklyn Bridge Park’s sound attenuating berms, leaving the Promenade alive and well for pedestrians. While the elected officials at the rally spoke against the DOT’s proposals, the protesters were not pleased with what they were hearing. The shouting started while State Senator Brian Kavanagh, who represents the area, was speaking. Assembly Member Jo Anne Simon received the most boos and chants after it seemed like she defended the DOT just for a minute. “Do more, Jo Anne!” “Find a better way!” people shouted. Borough President Eric Adams then took the microphone and spoke loud and fiercely. 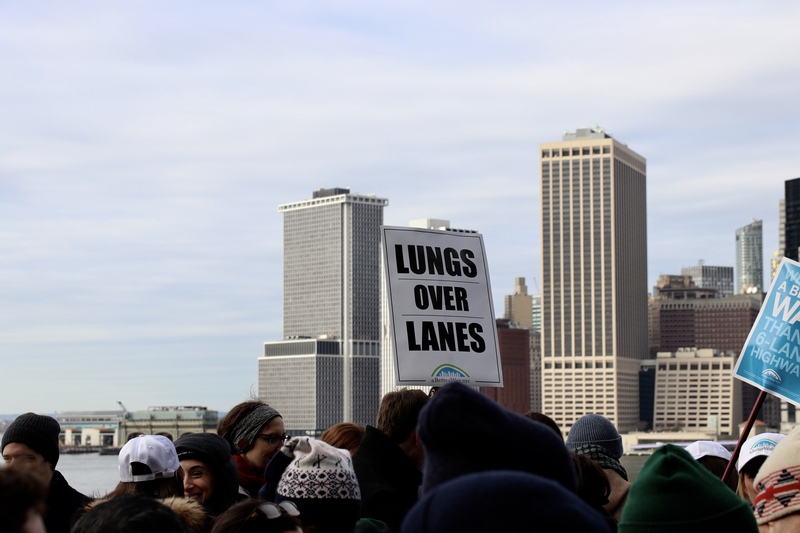 In October, Mayor de Blasio spoke about the DOT’s plan and said both options were painful. 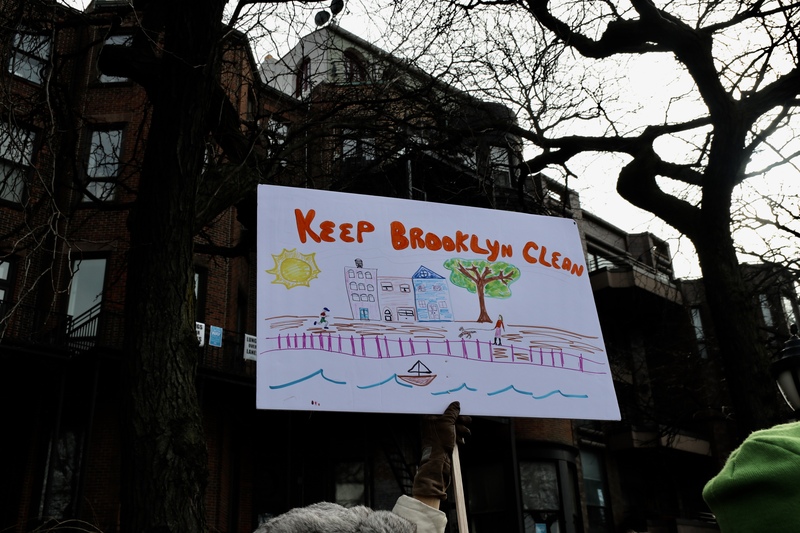 “The BQE is one of the lifelines of the city and it has to be fixed. If we don’t get to work fixing it soon, it will be out of service and that would undermine everything,” he said. 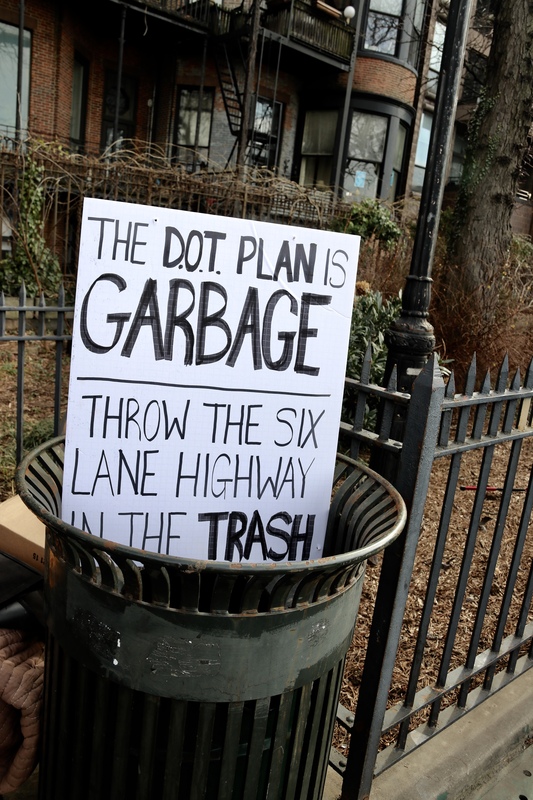 He said he preferred the six-lane highway plan over the “traditional” option because “I think it’s the way to address the bigger problem once and for all and as quickly as we can do it.” Though he acknowledged that it would “definitely cause a lot of inconveniences” and “definitely have a big impact” on the surrounding neighborhood. 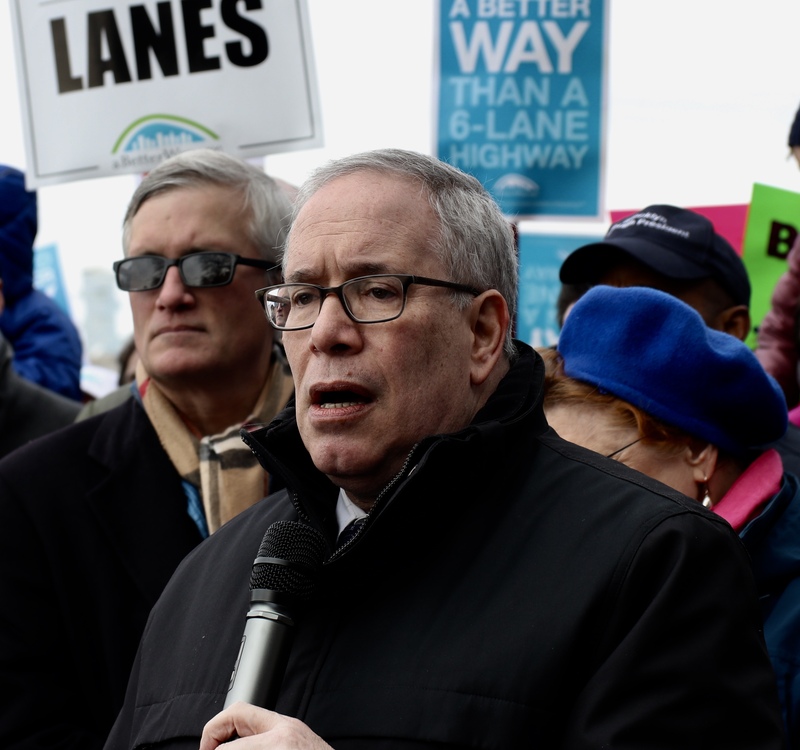 Comptroller Scott Stringer also spoke fiercely about the importance of hearing the community’s voice. A couple of weeks ago, Stringer sent a letter to the DOT questioning the transparency and accountability behind the proposals. On January 4, he received a response. 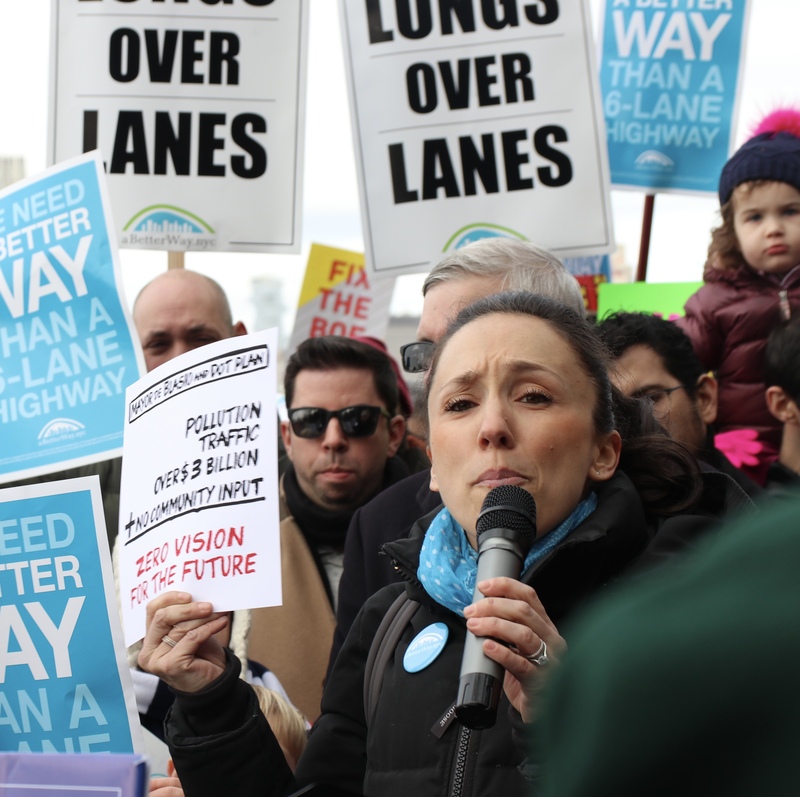 “It is important to reiterate that this project is just beginning its formal review process and that DOT remains committed to partnering with elected officials, community leaders… to ensure that their voices are heard and their safety is prioritized,” the letter by DOT Commissioner Polly Trottenberg stated. 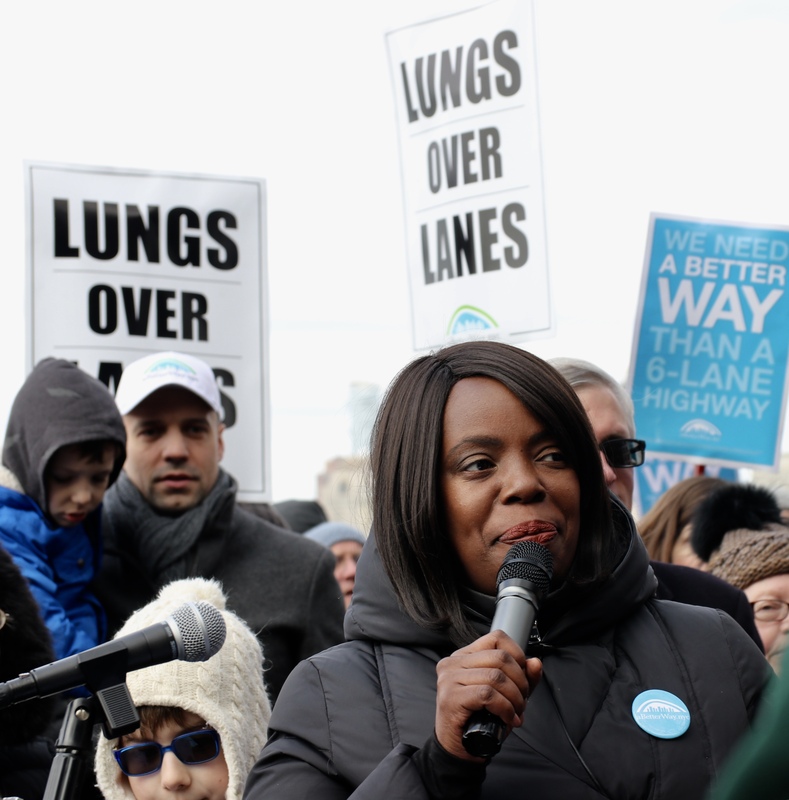 The Promenade means very much to Brooklyn Assembly Member Latrice Walker, who is running for Public Advocate seat, and she would hate to see it destroyed to build a six-lane highway. The second paragraph is incorrect. The diversion of traffic onto local streets occurs overnight and weekends for the duration of the project (8 years) under the traditional approach. The lane closures only occur for two years with the Innovative approach.